The Kingston Brooch, thought to be the most valuable single Anglo-Saxon treasure ever discovered, was found in the 18th Century by Reverend Bryan Faussett, curate of Kingston, in one of the early Saxon graves he excavated on the Downs above the village. It was found in a grave datable to circa A.D.630, during the time of the greatest of Kent's kings, Aethelberht, who was instrumental in the conversion of Kent, and eventually all of England, to Christianity following the mission of St Augustine. 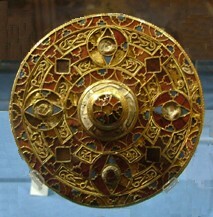 The brooch is now in the Liverpool Museum, together with much of the material recovered by Faussett.